Have you ever noticed how difficult it is to find a pair of booties that just work at all times? OK, maybe not with every single outfit, but ones that you can throw on and don’t have to plan your outfit around. Ones that are able to complete a look that you’ve already got figured out and act as the finishing touch (that’s what I call a low maintenance shoe – one that doesn’t call for one-on-one specialized attention). This issue – that is, figuring out what makes a bootie work and why – is what I want to focus today’s post on. But in order to fully answer that, I wanted to first talk about all the bootie styles you’ll find out there – at least popular ones. Because figuring out how to wear booties has a lot to do with what kind you’re trying to wear. Further, certain styles of booties are more limiting than others and tend to work better with particular styles (e.g., rolled up jeans, a dress, boot cut jeans, etc.). What are The Different Types of Booties? After years of putting together outfits, I’ve realized that I definitely need multiple styles of booties to make what I have in my closet work. In other words, one style of bootie doesn’t really fit all outfits. Wouldn’t you agree? And it can be challenging to know which style/color bootie is going to be my “winner” for the season – aka the one I actually wear more than once. It’s so frustrating when I think I’ve found the cutest bootie ever, I buy it, and then I’m only able to wear it like 2-3 times that season. I think we all know how that goes, right? So what is it about a bootie that makes it versatile or just work? Is it possible to define what the magic “it” factor is? I think so! I’m going to list my top go-to favorites when it comes to fall and winter booties. I’ll also explain why each one of them “works” with a certain style and why it doesn’t with other looks. This is a hard question to answer, but I think it’s one that MUST be addressed! When you think about the different styles of booties out there, let’s put them into two big buckets: closed-toe and peep-toe, but I’ll mostly be focused on closed toe booties and might dedicate a whole post come spring time for peep toe booties (thoughts?). Within the closed-toe category, there are different toe-bed shapes: pointed, broad-rounded, and roper-shaped toe-beds. A pointed toe bootie (regardless of the color or even material) is going to be more dressy whereas a rounded-toe bootie can be dressy or casual depending on the material, embellishments, or shaft-height. As I mentioned previously, in order to best answer the question of how to wear ankle boots (or booties), we need to address the different types of booties and the styling limitations of each. Aside from color and material, the style of heel is one of the biggest differentiators between booties and thus dictates how it’s styled and what it looks good with. High Block Heel – Any bootie that’s got more than a 3-inch stacked heel, is going to have a slightly dressier look to it – regardless of whether it’s made of suede or leather. A higher heel just looks dressier. One could argue that low or high stacked-heels are pretty interchangeable – it really just depends on your comfort and whether you can wear a higher heel for longer periods of time. How to style them: I wear my higher-heeled block booties with just about anything including jeans (both rolled up or even tucked in), skirts, and dresses. I love wearing a higher heel when I’m wearing a dress, shorts, or a skirt because the extra height elongate my legs (especially when there’s a split-front shaft showing more ankle). Recommendation: The ones I wear the most often are my Rag & Bone Bootie and my Vince Camuto in grey suede (which are sadly sold out). I’ve also had the BP. Block Heel Bootie on my list for years now and will probably bite the bullet eventually – I think they’re so pretty and flattering. Low Block Heel– This is going to be your everyday go-to bootie with a little bit of a heel. Personally, this is the bootie that I wear the MOST often and find to be the most comfortable – whether I’m wearing them for 2 hours or 12. How to style them: I wear my low block heel booties with rolled up jeans (these work PERFECTLY with a double roll! ), swing dresses, and skirts. You can wear just about anything with these booties – they’re incredibly versatile! Recommendation: I have several different color combinations in this style but the ones I wear the most often are my cognac and grey leather booties in the same style (you can find the exact style here – it’s under $100 and fits TTS). Wedge Heel – When it comes to wedge booties, I’ve found that they can be a little limiting but also offer a great alternative to an everyday stacked heel bootie. The material – whether it’s suede or leather – and the toe-bed shape – pointed or rounded toe – will ultimately determine what looks best with your wedge booties. 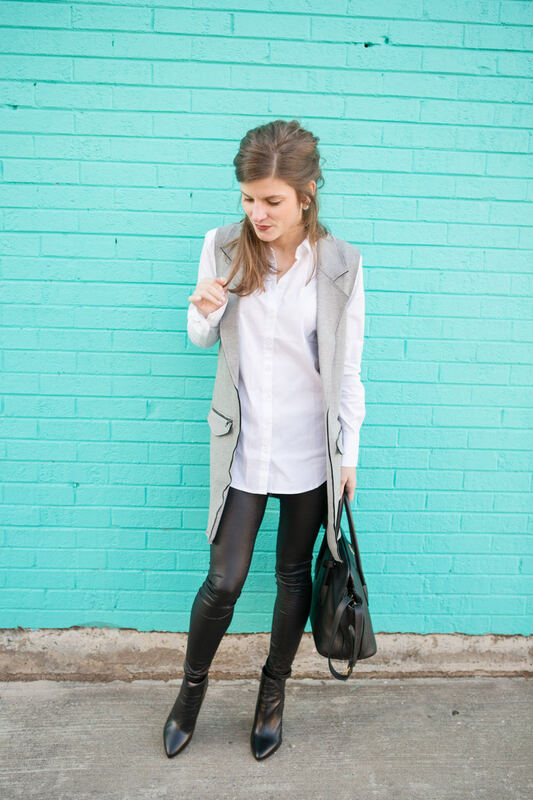 How to style them: Pointed toe, leather wedge booties (like these!) are cute with black tights or leggings tucked in. Leather wedge booties can also be worn with rolled up jeans; however, I’ve found that this look is a little more difficult to pull off and depends on how wide or loose the ankle opening of the bootie is. On the flip side, a rounded or even-pointed toe suede, wedge booties is almost interchangeable to regular heeled booties; they just offer an alternative if you want to switch things up. For instance, this outfit above would look just as cute with my regular cognac suede booties. In other words, the wedge bootie doesn’t really add much of a differentiation to the outfit. Stiletto Heel – In my experience, I’ve found that “heeled” booties – that is, booties with a stiletto or pointed heel – are always more dressy. These are best worn at night or for an upscale vibe. In addition to the shape of the heel, the heel height obviously plays a major role in how dressy the bootie is and what outfits it will work best with. How to style them: Specifically, higher-heeled booties – no matter what shape the heel – work better for dressier outfits worn at night or a polished daytime look. But it’s sort of hard to wear a high-heeled anything and not look a little dressed up, right? No Heel/ Flat – I don’t wear flat booties very often because I don’t think they’re flattering on my body. I’m pretty short and need a bit of a heel to feel put together (but obviously, that’s just me). Regardless, I wanted to cover them because they have an all together different look than booties with (even a little bit of) a heel. How to style them: Flat or no-heeled booties look cute with swing dresses and/or shorts during the summer or pre-fall months. They can look cute with rolled up jeans when styled appropriately, too. I’ve found that flatter booties have a boho-chic vibe and tend to look more casual than, say, a low stacked heel (western-ish) type booties. I’ve seen several Chelsea style booties that are super cute, as well as leather, pointed toe flat booties that can have a high-designer (dressy) feel to them. In addition to the style of the heel, the color, and material also play a major role in their versatility. Let’s dive into which colors work best and why. Of course there are endless color and material combinations out there, but I wanted to focus on those I find the most wearable. Even though I have and wear other kinds of booties, for the sake of choosing the best and most practical color combinations, I’ll be covering brown suede, brown leather, black leather, grey leather, and grey suede ankle booties. Finding the right shade/color of brown ankle booties is no easy feat. Let me tell you, this one took me ages to get right – let alone with a good fit and wearable shaft height. And even still, I’m always on the lookout for a good-looking brown bootie because I love having options when putting outfits together. But regardless of whether you have 4 pairs or just one of suede or leather, brown booties (specifically in a cognac shade) have proven to be necessary in making the most of my Fall wardrobe. I keep going back and forth on whether I think you need a pair of cognac leather AND cognac suede booties. Technically, you could make one or the other work all of the time, but for the sake of this article, I’m going to assume that both options are necessary. I’ll explain why, provide outfit examples, and then give shopping recommendations on pairs that have worked best for me. First up, I want to talk about the cognac suede ankle bootie and why it works. You could wear a leather bootie with whatever outfit you’re trying to put together, but there are some situations where suede just looks better. I’ll bring you through my thought process for why I chose brown suede in the 4 outfits featured above. Overall, I could have worn brown leather with each one of these outfits, but I feel like the contrast that leather brings might have overwhelmed and unbalanced the outfits. The light brown suede that my rag & bone harrow booties provide allows me to have more color in my outfits without competing for attention. The suede does not direct attention to my feet or ways down my outfit by putting the attention on my feet. In most cases, I feel like a good light brown bootie allows you to wear a warm color without looking like your outfit is a bunch of color blocks. Brown leather/ cognac booties are a great finishing touch to an outfit. They can definitely make or break a style and they way that I love to feature them most is in neutral outfits. A brown bootie has so much contrast and act as a great pop of color when paring it with neutrals. It can also tie in other brown accessories without overwhelming you with color. There are particular outfits, however where there can be too much color and be distracting. In each one of these above it acts as a compliment. One of my favorite ways to wear them is with black jeans. Something about this combination (black and brown) just works all the time and makes me feel effortlessly put together. Grey ankle booties – Second to cognac leather ankle booties, I’d say that having a great pair of neutral-toned (either grey leather or taupe leather) ankle booties is just as important. For outfits where cognac leather is too much or just doesn’t look right, these will come in handy. I’ve actually found myself wearing these MORE often than I wear my cognac leather booties, although I still think the cognac ones are number one on the must-have list. There’s something about a neutral tone that really comes in handy sometimes when putting together outfits. I’ve had this pair of grey leather booties for almost 4 years now and I’ve worn them more than any other shoe in my closet – hands down. If you don’t get anything out of this blog post, hear me say that you should get yourself a pair of these booties in grey leather. And you can thank me later! Black leather ankle booties – Despite what some may say, I’d be willing to argue that a black leather ankle booties isn’t quite as necessary as the two I’ve listed above. Maybe it’s just me, but for some reason I find myself wearing these less often. Even when I do end up wearing them, I feel like I could have just as easily worn my grey leather pair. They are also a lot heavier on your feet, something about them just can weigh down an outfit and make it look unbalanced. Recommendations: I have the same Lance bootie (under $100) in black leather too and it’s what I’m wearing in the two outfits featured above. I also have pointed toe (mine are dee keller and old, but these are cute too!) black leather wedge booties and love them to wear with leather leggings (like I did in this outfit above) or black tights. It’s nice to have the pointed toe leather option for dressing things up. Signup For More Style Tips!